Top of this Premier League injury table are Newcastle United. New research shows that over the past three years, Newcastle players have lost more days to injury than any other Premier League club. What is most remarkable about Newcastle’s place in the table, is that this relates only to days lost whilst being a Premier League club, so it is only NUFC injuries covering 2014/15 and 2015/16 which are included in these stats. A more cavalier attitude was taken with injured players in previous years, with Alan Pardew in particular taking what many felt was unnecessary risks with players who had been out injured. Rolando Aarons in particular seemed to suffer longer-term from this, having been rushed back for the League Cup match at the Etihad in October 2014, Aarons scoring and Newcastle winning 2-0, but the winger then was shown to have come back too soon and had another prolonged absence from the squad. Making up the Newcastle United stats, you have 137 individual injuries that produced 5,172 lost days in the Premier League, with 137 individual injuries. Apart from Aarons, you had many other players out long-term, with Aussie defender Curtis Good top of the list, missing 501 days in this time period of Premier League football. Also out for long spells you had Haidara, Elliot, Krul, Steven Taylor, Obertan, de Jong and numerous others. This table being published sadly coincides with a relative rush of injuries under Rafa Benitez, who always errs on caution when bringing players back after injury. Rafa is set to be missing the likes of Jamaal Lascelles, Mikel Merino and Christian Atsu when they travel to Old Trafford on Saturday. The Premier League injury table was published by Sick Notes, using data provided by injury data specialists physioroom.com. 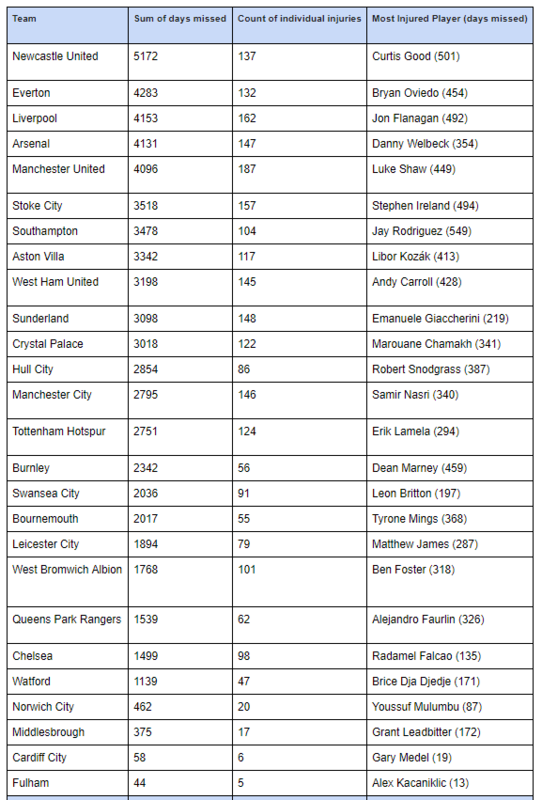 ‘Following the latest news that yet another international break has resulted in key club players Sadio Mane and Phil Jones pulling up injured, brand new research takes a look at the injury records of every player and club in the Premier League over the past 3 seasons. According to Sick Notes, the most injury-prone club in the Premier League is Newcastle United, with 137 individual injuries to 35 different players causing 5,172 days to be missed over the past 3 seasons.